A VARK Short Profile can help you understand your preferences for learning. 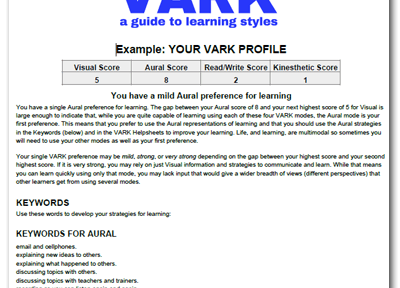 A PDF file containing helpful advice about your learning is customized from your VARK scores. The VARK Profile is available immediately after you complete the VARK questionnaire online and elect to pay. Instructions about it can be found at the end of the VARK Questionnaire. The short profile contains a page of information about your learning preferences, as well as a copy of the Helpsheet(s) that are relevant to your preference. The price is $5 NZ – about $US3.50. For a more in depth understanding, try an Academic Profile containing several pages of advice. You can download your profile immediately after making your payment.